You can sure get the cheap stuff from the supermarket, but if you realize it's working for you, buying several kg in bulk costs hardly more than the packets on containers you will find in the baking section of your local grocery store. For SuppVersity veterans, it's no news that you can take your 0.3-0.5g/kg body weight of baking soda, i.e. 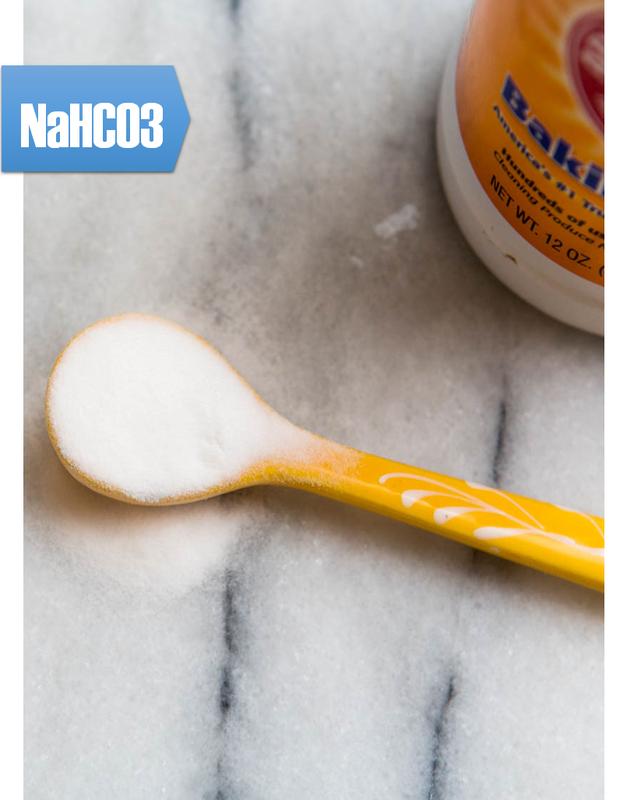 NaHCO3 or sodium bicarbonate, spread across three days before an event and still see enormous benefits. I discussed this strategy and corresponding evidence in form of a study in trained cyclists as early as in 2012 (My, that's more than 5 years ago... reminds me that I have been doing this for quite some time, now ;-). In the meantime, I have repeatedly addressed the performance enhancing (and health) effects of bicarbonate, but ... and that's relevant for those of you who cannot stomach large(r) quantities of baking soda... 99% of the newer studies on performance are conducted with acute sodium bicarbonate dosing in the previously mentioned range of 0.3-0.5g/kg. If you weigh 75kg that's the whopping amount of 37,5 grams of pure baking soda consumed within (usually) 60 minutes before a workout - you better make sure that this doesn't give you the runs (which is, unfortunately, not exactly unlikely) before doing that during competitions. Serial loading may offer a way out of the diarrhea risk trap. 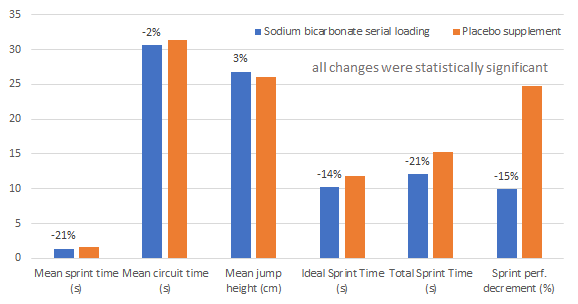 Unlike in the previously cited 2012 study by Driller et al., the international research team (UK, AUS, ESP) who conducted the most recent serial loading study, studied the effects of bicarbonate serial loading in fifteen female university basketball players (23.3±3.4 years; 173.1±5.8 cm; 65.8±6.3 kg; 23.6±4.9% body fat). Figure 1: Illustration of supplementation and exercise test (Delextrat 2018). "Indeed, it has been recommended to use higher quantities than the 0.3 g/kg body mass commonly administered, while serial loading avoids the GI disturbances usually reported with such doses ingested acutely (Burke & Pyne, 2007 | free full-text on researchgate). In addition, capsules were preferred to powder to mask the taste of the substances ingested and allow blinding of the participants to the experimental conditions" (Delxtrat 2018). Now what's really interesting is that the scientists advised their subjects to consume the capsules not just spread across three days, but also in three equal amounts throughout the day (during breakfast, lunch, and dinner), with the last ingestion at 7pm on the day before the test. No, you won't miss out on nutrient digestion and die from a heart attack: Whatever you eat, it WILL ALWAYS increase your gastric pH significantly and a healthy tummy is well capable of - actually constructed to reacidify the chyme in no time (honestly, if you want to worry, worry that the meal interferes with the absorption of bicarbonate - well, ok, the study at hand shows, it doesn't; at least not to a degree that would blunt the effects). And if you're afraid of salt = high blood pressure, calm down and read Luft's seminal paper on this issue - a paper that showed a reduction in blood pressure w/ NaHCO3. For both aspects, it must be said, though, that your individual response can always differ from that of Mr. and Mrs. Average. During the supplementation period, participants also reported any gastrointestinal (GI) side effects on a 10-point Likert scale; sprint and circuit times, jump heights, performance decrements and gastrointestinal (GI) side effects were recorded during the test and blood lactate concentration was measured pre- and post-test. 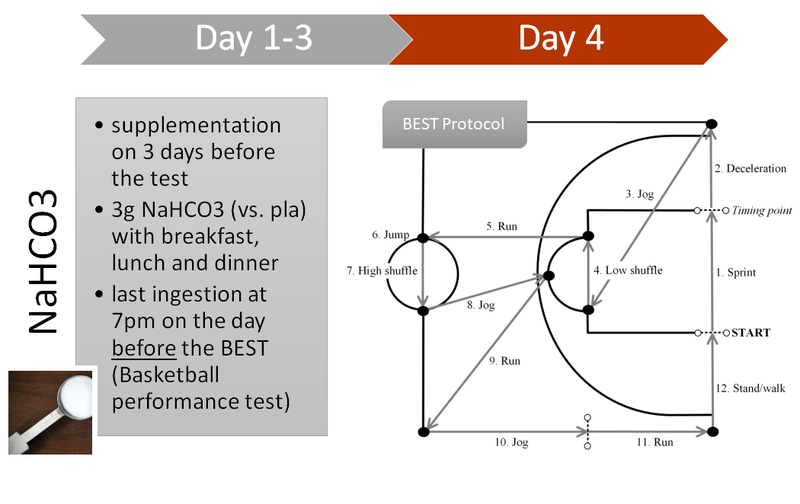 Effects of 3-day bicarbonate loading on performance markers during a simulated basketball game (Delxtrat 2018). As you can see in Figure 2 the regimen worked like a charm. With significant improvements in mean sprint time (s), mean circuit time (s), mean jump height (cm), ideal sprint time (s), total sprint time (s), and a sign. reduction in sprint performance decrement, the scientists recorded potentially game-changing (literally) performance increments. So, NaHCO3 serial loading can increase performance, but what about GI stress? At least for those of you who have been avoiding bicarbonate supplementation because it gives you the runs, Anne Delextrat et al. have good news. The risk of diarrhea or other GI side effects was, after all, not just reduced - there were simply no side effects (at least none that weren't observed with the placebo supplement, as well). Planning to fry your legs? 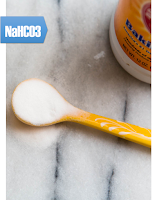 Ingest 0.3g/kg NaHCO3 before your workout! So what's the verdict, then? With dozens of positive studies, there's little doubt that bicarbonate will improve your performance in high-intensity (not-ultra-short, like 1x1RM) exercise; and still, it has yet been used only by a minority of athletes. Why's that? Well, you can ask toilets in gyms all around the world: GI stress. With the study at hand being #2 on a list of very convincing (since well-done) studies on bicarbonate serial loading and the first to show that serial loading of sodium bicarbonate is effective for (ball based) team-sports such as basketball, I would expect that more and more people jump on the bicarbonate bandwagon. And they'd have a good reason: it may not have doubled the subjects' performance in the study at hand, but a significant improvement in repeated sprint and jump performance during competition is a performance benefit no pro-athlete should deny. What we do need, now, are (a) more studies in different athletes, and (b) long-term studies testing if the increased training performance would also faster/more complete adaptation to training "on NaHCO3" | Comment! Luft, Friedrich C., et al. "Sodium bicarbonate and sodium chloride: effects on blood pressure and electrolyte homeostasis in normal and hypertensive man." Journal of hypertension 8.7 (1990): 663-670.